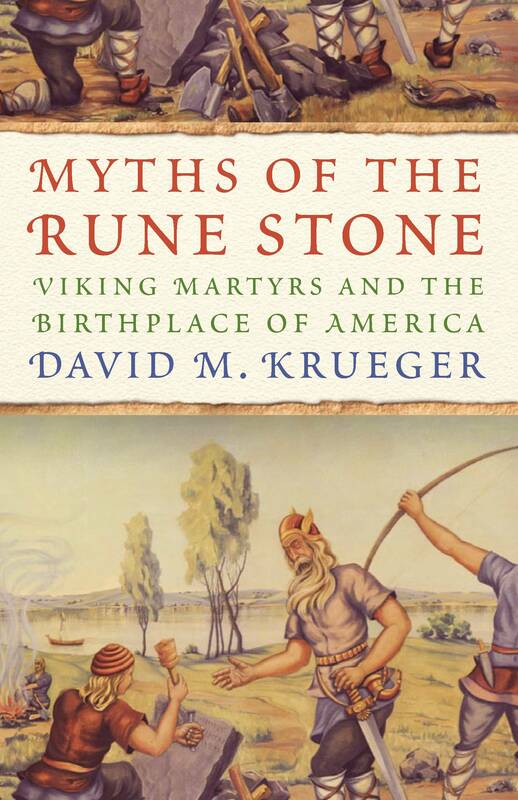 Myths of the Rune Stone: Viking Martyrs and the Birthplace of America was published by the University of Minnesota Press in October 2015. Get your copies now through through Amazon or an independent bookstore near you and be sure to “like” the book on Facebook! What do our myths say about us? Why do we choose to believe stories that have been disproven? David M. Krueger takes an in-depth look at a legend that held tremendous power in one corner of Minnesota, helping to define both a community’s and a state’s identity for decades. In 1898, a Swedish immigrant farmer claimed to have discovered a large rock with writing carved into its surface in a field near Kensington, Minnesota. The writing told a North American origin story, predating Christopher Columbus’s exploration, in which Viking missionaries reached what is now Minnesota in 1362 only to be massacred by Indians. The tale’s credibility was quickly challenged and ultimately undermined by experts, but the myth took hold. Faith in the authenticity of the Kensington Rune Stone was a crucial part of the local Nordic identity. Accepted and proclaimed as truth, the story of the Rune Stone recast Native Americans as villains. The community used the account as the basis for civic celebrations for years, and advocates for the stone continue to promote its validity despite the overwhelming evidence that it was a hoax. Krueger puts this stubborn conviction in context and shows how confidence in the legitimacy of the stone has deep implications for a wide variety of Minnesotans who embraced it, including Scandinavian immigrants, Catholics, small-town boosters, and those who desired to commemorate the white settlers who died in the Dakota War of 1862. Krueger demonstrates how the resilient belief in the Rune Stone is a form of civil religion, with aspects that defy logic but illustrate how communities characterize themselves. He reveals something unique about America’s preoccupation with divine right and its troubled way of coming to terms with the history of the continent’s first residents. By considering who is included, who is left out, and how heroes and villains are created in the stories we tell about the past, Myths of the Rune Stone offers an enlightening perspective on not just Minnesota but the United States as well.